What is it about the summer camp environment that brings about the desire to lead? Studies continue to show that children that frequent summer camp have a tendency to take on leadership roles in the workplace and school later in life. At Camp Waukeela, our programs and activities are designed to develop the leadership skills of our campers by teaching them how to cooperate with others, how to lead, and how to teach and coach. The summer camp environment has many elements that foster leadership skills in those who attend, but there are three primary factors that are necessary in providing such an atmosphere. If you’ve spent time at camp before, you probably remember having a favorite camp counselor that you looked up to above all else. Indeed, SADD (Students Against Destructive Decisions) points out that young people themselves rank counselors as some of the most influential people in their lives. Why is this? When children first attend a sleep-away camp, it is important to note that they are leaving their parents for an extended period of time in which they are relying on young adults they don’t know to become their primary caretaker. Counselors at Waukeela can range from the ages of 18-25. This age group is so important because it’s far enough away from the child to instill a need to show respect, but close enough to create a sense of comfort in knowing that they can grow up to be “just like their camp counselor”. Counselors are also trained to be positive examples and inspire young individuals into trying new things, while encouraging them to set examples for those younger than them. These young adults apply to be camp counselors because they enjoy children and thrive by being able to make an impact on a child’s life. When you throw a group of adults with these aspirations into one place, the results are bound to be beneficial. Campers will become accustomed to the endless positivity, smiles, and encouragement that counselors give off on a daily basis. It becomes almost contagious. It’s then easy to understand why children begin to want to be the same and mimic similar personality traits that their favorite counselor exhibits. If you think about the team building exercises that were thrown your way as a camper, it all makes sense. 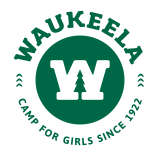 Camp activities at Waukeela are designed to bring about a leader in order to accomplish something. For example, let’s think about the human pretzel. Everyone gets in a circle and grabs hands with the people on the right and left of them effectively tangling themselves into a clustered pretzel shape. The goal is then to communicate and work through maneuvering back into the original circle without letting go of hands. It would not be effective to have every single person move about on their own, nor would it help to have a multitude of voices speaking up at once. One person must task themselves with the role of being the leader and mediator in order to untangle the mess that everyone finds themselves in. This popular team exercise seems like one that is made only to create effective communication, but in reality, it’s also designed to bring about a solitary leader to accomplish the ultimate goal. Waukeela is structured in such a way that permits constant teamwork and service throughout the day. Whether it is by setting the tables before a meal, cleaning up an area of camp, or gathering wood for campfire, campers have the chance to see themselves as members of a community. Every member has to pull their weight in order for the community to benefit. When campers recognize the value that they bring to their community, they often starts to look for other ways that they can serve and help others. There are a ton of aspects of summer camp that inspire children to become leaders later on in life. A summer spent at camp is one of the most beneficial and important experiences a child can have because it helps that develop and foster life-long skills that are harder to acquire in other environments such as school and home.